This area has an extreme climate (climate zone 7) in which plants must acclimate in order to do well. Large retailers typically order their plants from one or two suppliers in various parts of the country... typically not this climate zone. That's fine for small annuals... flowers for flower beds, vegetables, etc. 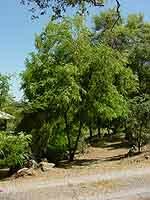 Black Locust is a fast growing, flowering tree that provides shade quickly. It drops lots of seeds and will spread quickly as well. Spreading can be controlled with Roundup if necessary. But for trees and shrubs that you want to be sure do well and get off to a fast start, it's important to buy from a nursery that grows them locally (or at least acclimates its stock). Then the plants are hardy enough to do well in this extreme environment. Also, be sure you know your climate zone in the specific area that you are located. In the Sierra Foothills, you can change climate zones with a matter of 200 to 500 feet difference in elevation. Our property alone probably has a 300 foot elevation difference from east to west. There are things that grow well on the upper portion that simply will not grow lower, and visa versa. When you buy, be sure you buy from someone who can guide you on planting & watering, as well as size, sun & shade, summer & fall colors, etc. And remember, you're going to live with these plants for the rest of your life. Buying things because they're cheap isn't necessarily going to serve you in the long run. Get what you like so YOU can enjoy what you create! If you're on a budget and simply can't afford to buy (or don't have the energy to plant) everything at once, where do you start? Trees. Planting trees first does two things... it helps you control the sun's heat faster than anything else, and it provides the framework for a more comprehensive garden design later. Next comes shrubs. They can fill in spaces where the trees don't provide all the shade you'd like. Plus, flowering shrubs can add color and texture to your gardens year-round. Last but not least, add your perennial flowering plants. That's not to say that you can't add annual flower beds to brighten up things a bit, but ideally, you would add the perennial flowering plants last. By going about your gardening project like this, you'll then know where you'll be able to place perennials that require full sun, dappled sun, and full shade. And in the end, you'll have a beautiful, well-balanced, layered look, with enough different colors and textures to make your outdoor area beautiful year-round.